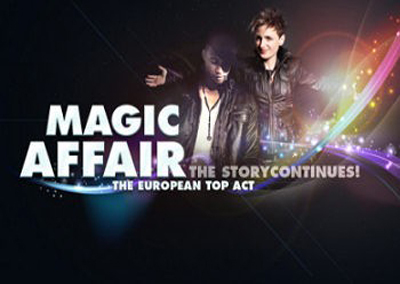 Magic Affair has proven themselves worthy to be among the most successful dancefloor acts in Europe. They have had many top ranking chart positions all over the world, received Gold and Platinum awards and one “Echo” in 1995 for the category “Dance Single Of The Year” national, for the single OMEN III . In December 1993 OMEN III was released, in 1994 the single reached the #1 position for 6 weeks in the German MM Charts, Charted #6 in Great Britain, and achieved high Chart positions worldwide. 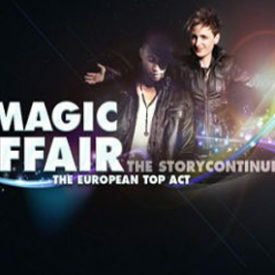 Magic Affair continued their success with 3 more singles Give me all your love #7 on the German charts, In the middle of the night top 30 on the German charts, and Fire Top 50 on the German charts, followed by the release of their hit album Omen the story continues which reached high Chart positions around the world! Homicidal which was an additional track on the 2nd single Give me all your love , which was a hit at clubs where DJ’s didn’t play commercial music. In 1995 they released the hit singles Energy of Light , World of Freedom and The Rhythm Makes You Wanna Dance from Magic Affair‘s second album Phenomenia was released in 1996. In 1996 Magic Affair also released a remake of Queen’s Bohemian Rhapsody . In 1997 Magic Affairreleased the single The Night of the Raven . Since 2007 Magic Affair’s original artists Franca Morgano and A.K.-S.W.I.F.T. are back on the road again and have been in studio recently working on new material. Watch out!!! 2010 the story WILL continue once again. Nitro is one of germanys most successful rappers. Since his first appearance with the Brothers Keepers in 2001, he proved himself to belong to the rappers elite by numerous single, features and shows. With that he scored national and international chart hits under a synonym or his own name as artist, MC and as a songwriter in different genres from Rap, Pop, R&B, Electro/House to Rock.